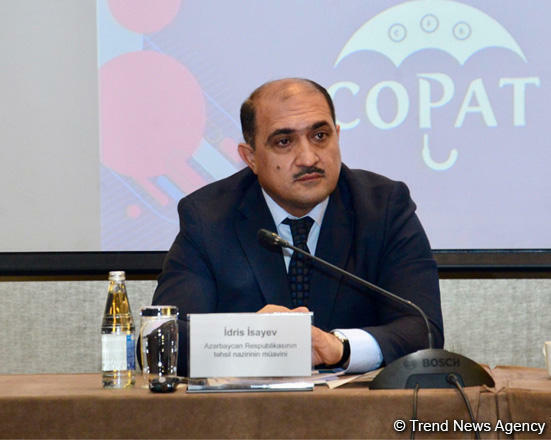 A large-scale project aimed at supporting and strengthening the education system is being prepared in Azerbaijan, Deputy Minister of Education Idris Isayev said, Trend reports on Feb. 11. Isayev made the remarks in Baku at a conference titled "Innovative Development and Economic Reforms: Role of Intellectual Property and Technology Commercialization", devoted to the signing of a memorandum of cooperation between the Intellectual Property Agency and the Center for Analysis of Economic Reforms and Communication. "The project will last for two years," Isayev said. He stressed that big changes were made to the Law on Education in 2018, aimed at improving education, as well as the quality of knowledge of students and pupils. "The changes envisaging the use of modern information technologies in the education sector were also made," he said. "The merger of education, science and high technologies creates a single format, a single innovation platform that meets modern demands."